« Oregon: World Record Holders! It was a rainy day that resulted in a change of plans. And it wasn’t like tolerable sprinkles… but more like pelting you in the face with tiny shards of glass rain. I asked the hotel clerk, while I was checking out, what sort of indoor activities there were to do in the area and he made two suggestions; the Newport Aquarium or Ripley’s Believe It Or Not. I opted for the aquarium because if there is a chance to see penguins I am going to take it. The Newport Aquarium is not pet friendly so Boomer and I did a few victory laps around the parking lot and then he waited in the car while I visited the aquarium. The only perk to it being a rainy, cold day was that I did not have to worry about Boomer sitting in the car. The aquarium is broken up into sections with the Sandy Shores Exhibit being first. Here I found Speckled Sanddab fish and Sea Pens. 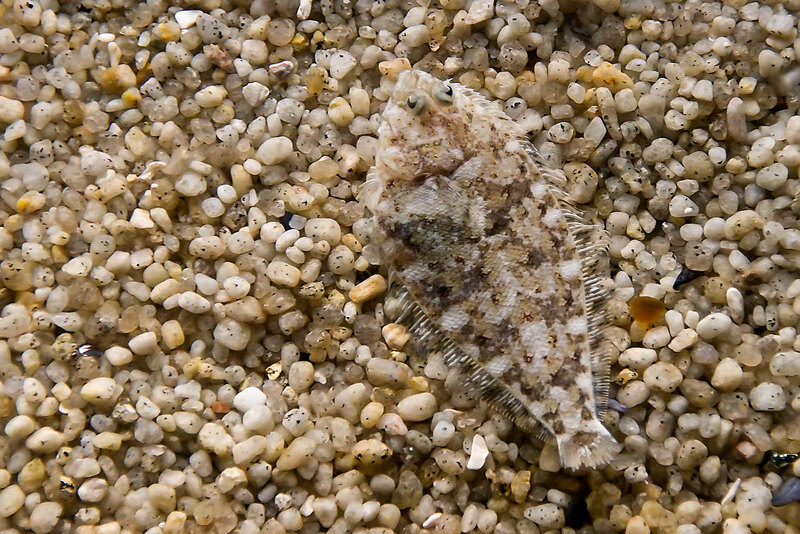 The Speckled Sanddab fish looked like they could win a round of sea-hide-and-go-seek EVERY time. You could spot them in the rocks occasionally as they made a small movement. It did take me a bit to find the fish because as I stood looking into the tank I thought to myself ‘what are the people standing here looking at?’ The Sea Pens were also fascinating. They looked like huge feather pens that danced around in the water waiting to be picked up by some famous writer to pen their next manuscript. The Rocky Shores exhibit was next and my favorite indoor exhibit. There was a large pool of water filled with sea life. The area is manned by a staff member to keep an eye on the exhibit… or more like anyone who is too grabby with the animals. 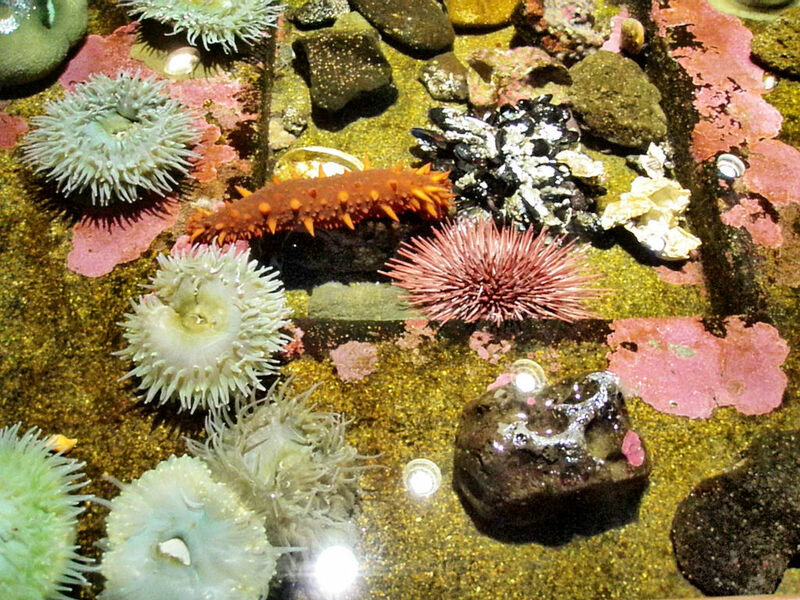 You are free to touch and feel the sea stars (what were once called star fish), gumboot chitons and anemones in the touch-pool. I liked this exhibit so much that I came back for a second helping later during my visit. I then moved into the darkly lit Coastal Waters exhibit. 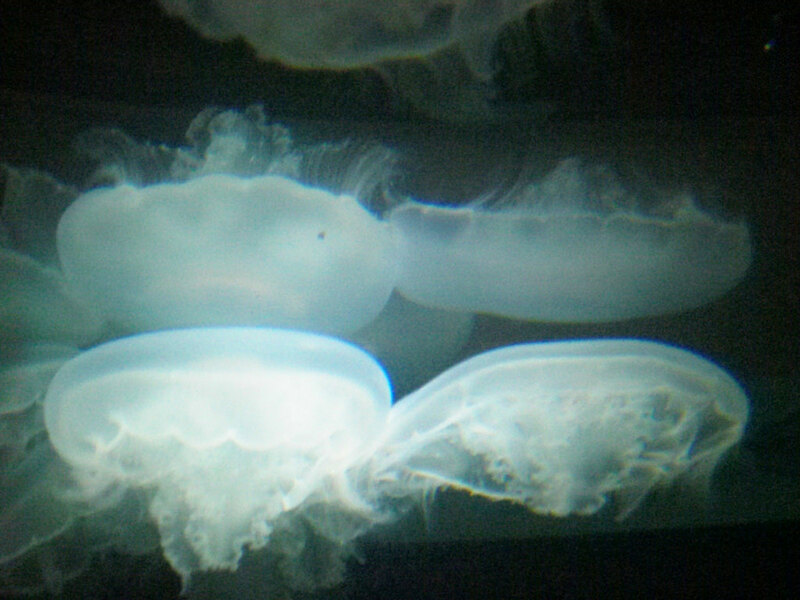 As I walked through the doorway I was greeted by Moon Jellies eerily swimming their way around the tank. I found them entertaining only as I was not swimming in the water with them… I later found out that Moon Jelly Fish are not harmful to humans, only small marine life. Regardless I’ll skip the swim with them. 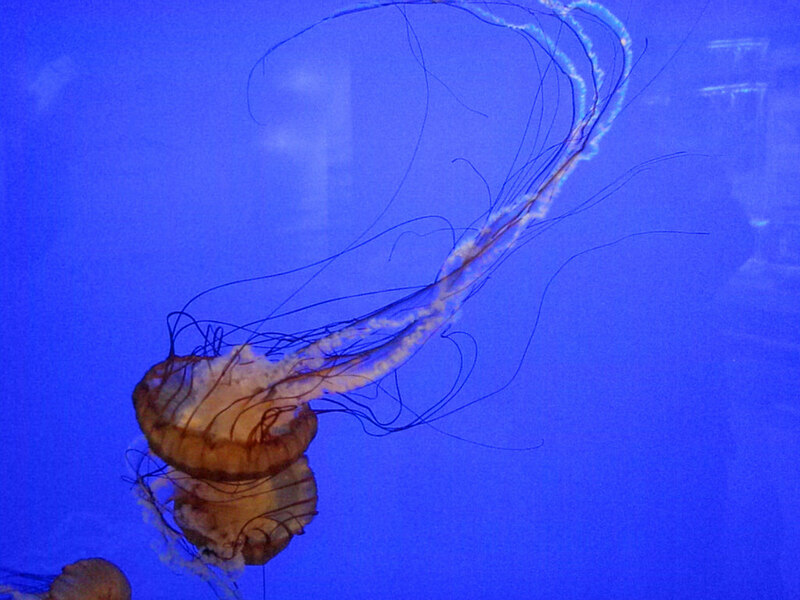 Also located in the Coastal Water exhibit were the Sea Nettles, who were displayed with an impressive deep blue background which helped pop the orange color of the jelly fish. Again not overly harmful to humans but still I’d swim away … fast. I could pick this tuffed puffin up and squeeze him he’s so cute! It was now time to brave the outdoors. The rain was only a sprinkle, something to be expected in Oregon, so I walked outside to see the Aviary Exhibit. Unfortunately there were no penguins but I was spoiled with puffins instead. In my opinion this was a great trade off. Penguins are super cute, but so are puffins. 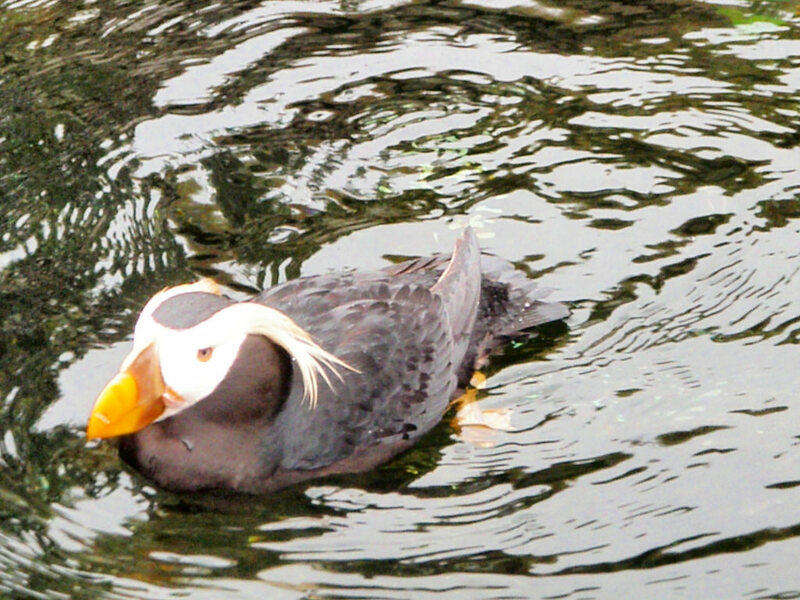 I specifically liked the tufted puffins, which was apparent from my photos as I primarily took photos of them. I think he has his eye on me! I headed back inside for the Passages of the Deep, which seems to be a common exhibit set up for aquariums, a tunnel through the “sea”. 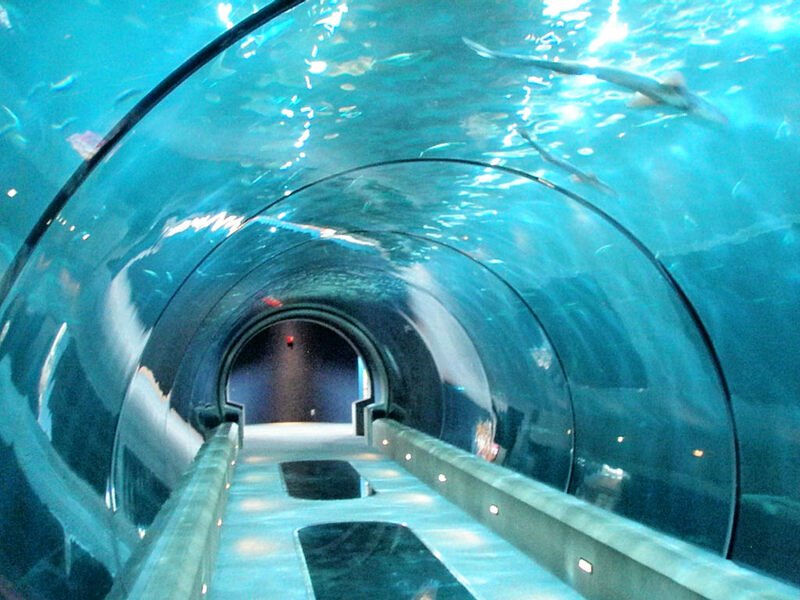 Sharks swam overhead as I walked through the tunnel, which allowed me to feel as though I was submersed in the ocean with the sea life minus getting in a swimsuit. Sea Otters – they could be cuter… said no one ever! t was nearing feeding time so I headed back outside. 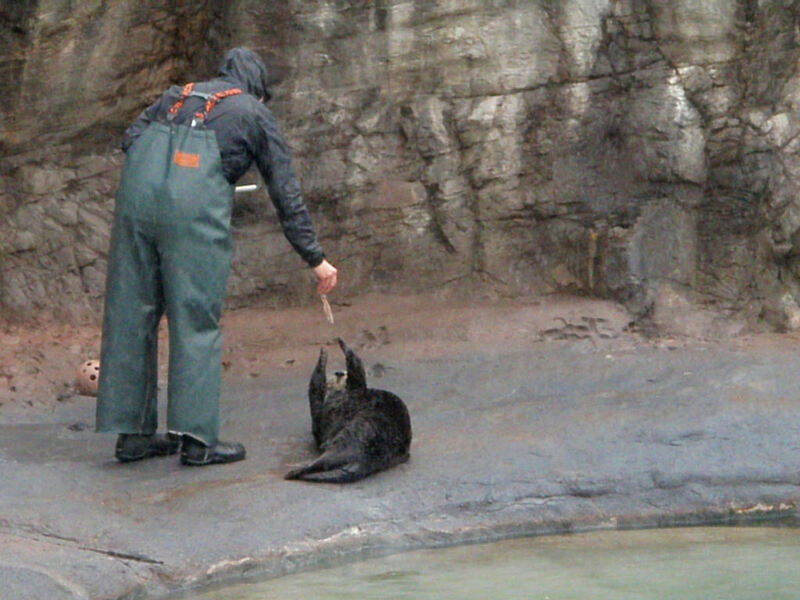 Although it was not my feeding time, but feeding time for the sea otters. These adorable creatures were hams for the camera while we waited for the staff to come out for the afternoon feeding. They continued their ham like behavior even with the staff and put on quite the show for everyone as they “worked” for their meals. 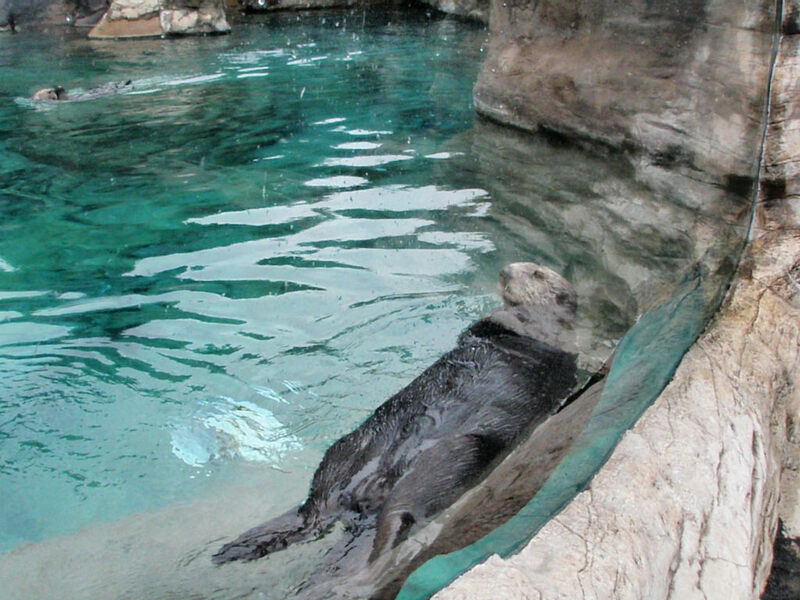 The otters were my favorite exhibit out of the entire aquarium. In addition to being overly adorable, they were very interactive with the crowd and loved showing off their fast swimming abilities. My last stop of the day was the Octopus Exhibit. Perhaps it was watching 20,000 Leagues Under The Sea one too many times but octopuses kind of freak me out. Granted I was not in a submarine and this little guy wasn’t capable of pulling down an entire submarine, but I’m sure given the chance he could pull down a dingy. He moved around the display window, eerily shifting about while captivating his audience. The Newport Aquarium is located at 2820 SE Ferry Slip Road. Summer Hours are May 24th – September 2nd from 9 am to 6pm. Winter hours are 10 am – 5 pm daily September 3rd – May 23rd. Ticket prices for adults is $19.95 USD, Seniors and Young Adults (13 -17) $17.95 and Children 3 and above is $12.95. 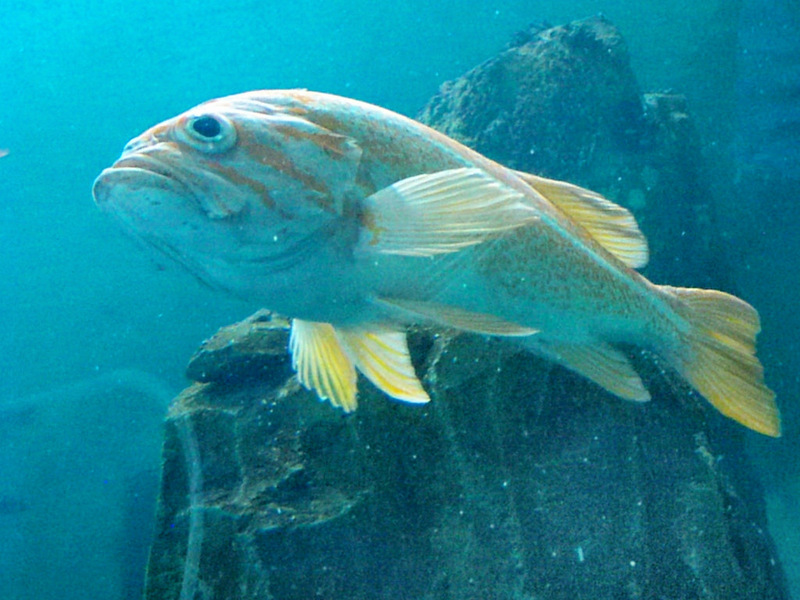 Tagged aquarium, things to do newport oregon. Bookmark the permalink. Looks like a really neat place with plenty to see! We haven’t been to Oregon (yet) but I hope we will, some day, so I’ll have to make sure we see this place. The Oregon Coast is full of amazing things to do. I hope you get to visit there soon!